The subject of pork, while fascinating and delicious, isn't exactly a hotbed of innovation (which, of course, we find unfortunate). You've got your pork chop, your pork shoulder, your bacon and so on down the line. And you're not complaining. But when a cultishly fawned-over Austrian pig with white curly hair suddenly shows up on the East Coast for the first time, you can absolutely count on us for breaking coverage. Welcome to the wild wooly world of the much-ballyhooed Mangalitsa Pig, now in New York, available for purchase... and, for one night only, on the menu at the Spotted Pig tomorrow. 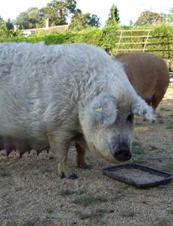 Since you're probably asking yourself what's the big deal about a crazy sheep-looking pig with curly white hair (think of the Mangalitsa as the Doc Brown of farm animals), well, it's all about the fat. The Mangalitsas were bred as hardworking farm pigs in the cool Austrian climate, so unlike lean American pigs, these bad boys have a thick white layer of fat (which conveniently matches their white hair) that apparently adds a whole new level of flavor to the table. Of course you can order up some meat from the wholesaler, but the fastest way in is at the Pig tomorrow night for Mangalitsa Pork Belly with Agen Prunes, Trotters and Mashed Potatoes.